Cool sophistication and style is the essence of the contemporary range. With their smooth lines, beautiful curves and fabulous textures, these bedrooms create modern but restful spaces which will make you want to stay just that little bit longer. Mirrored doors and beautiful colours allow you to express your imagination & your own individual style. We are a family run business and we pride ourselves on our friendly service. We don't believe in hard selling we really do listen to our customers ideas. 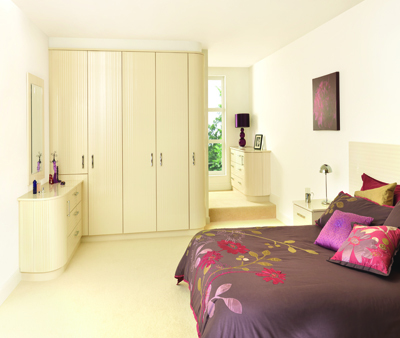 You know what you want from your bedroom, and we simply use our expertise to help you make those ideas a reality. Once you've contacted us, we'll call at a time when its convenient to you. We'll bring a range of finishes for you to look at, we'll measure your room, and discuss with you exactly what it is you are looking for, After that we'll draw up a workable plan, taking care of any technical details which may need to be considered, and provide you with the options and costs. We pride ourselves on providing the best quality furniture at unbelievably affordable prices so what have you got to lose? contact us we are always delighted to help!